"The incredible story of the team that changed the game forever." I love watching movies. Most of the time I romantic movies. I do not go out if I have a movie to watch. I can stay home for days on end and I have no problems provided I have movies to watch. So writing about a movie is really good for me. Now let me go straight and talk about the movie. 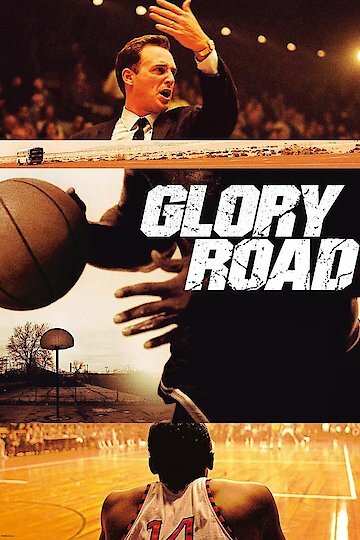 This movie is titled glory road and it was acted in 2006. Glory road is a movie that talks mostly about basketball scenes. It is talking about one coach, Don Haskins (Josh Lucas). He basketball episodes are thrilling. Come to think of it Basketball is a game that can put you off and again make you feel like you want to fly. I love basketball. I wish I could take part in it but I am not a sports person. Back to the movie. Hakins was the coach at Texas Western. He inherited e black players. When he took up coaching the Texas Western team he black five black players that he took to NNCA titled games. Texas Western played a match with Kentucky played a basketball match. The Texas western players were very large. While the Kentucky players were not that big. In the season finals, Kentucky was ranked first while Texas western took the 3rd position the season that just ended. These basketball matches are dominate the films. Their successes and glories are the take of the day. Race conflicts come up and puts the team in disarray. I do not know. But what I know is that the black players were very very good. they played like no one has ever done and took their team to higher heights in the basketball league. Treats started coming in because of jealousy. The coach's life was threatened severally. What I like is that the coach still continued coaching team even after the threats. This means that he really loved his job. More especially the players he had learned to be with most of the time during practice sessions. There was a lot of hatred amongst members in the Texas western team because of racism. This a lot of in fighting between the black boys and the white boys in the team. Glory Road is currently available to watch and stream, download, buy on demand at Hulu, Amazon, Vudu, Google Play, iTunes, YouTube VOD online.